The second annual Queen of Bacchanal Pageant is fast approaching, and six lovely ladies from across the country will be vying for the grand title on Saturday, September 10th at the Honorable Louis Sylvester Sporting Complex. The theme for this year will be “Breaking Down All Barriers: One People, One Nation.” Held as a fundraiser for Mystic Mas Band, the pageant already has following. Hoping to win the pageant are contestants Vanessa Williams, Princess Acosta, Cristal Ruth McCullough, Felicia Gladden, Kristen Igner Fuentes and Shayna Ariola. The pageant will focus on excitement and energy with a centralized Caribbean Carnival theme, and contestants will be judged on swimsuit, talent, and carnival presentation. Vanessa Williams is from Belize City and enjoys singing and dancing. Her favorite artist is Machel Montano, and her favorite soca song is ‘Can you feel it’ by Aron Duncan. Her life ambition is to be an educator, and be the best teacher she can be. Princess Acosta is also representing Belize City. Her favorite hobby is dancing, and her favorite artist is Machel Montano. Her favorite soca song is “Truck on the road life”. She hopes to become a police officer. Also hailing from Belize City is Kristen Igner Fuentes. Her hobbies include football, dancing, and acting. Her favorite soca song is “Truck on the Road” by Bunji Garlin, and her favorite soca artist is also Machel Montano. She hopes to be a good role model to her daughter and the youth of Belize. Cristal Ruth McCullough will be representing Ambergris Caye. Her hobbies include, dancing, poetry, singing, and arts. Her favorite artist is Destra Garcia, and her favorite soca song by her is “Lucy”. Her ambition is to become a successful business owner. 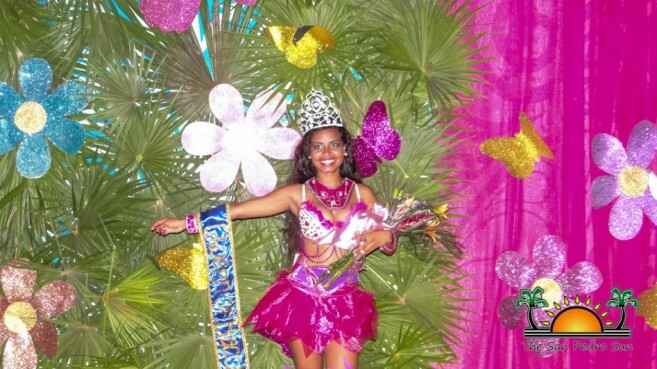 Felicia Gladden is representing Santa Elena Town in the Cayo district, and she enjoys dancing and singing. Her favorite song is “Too Real” by her favorite artist Kerwin Du Bios. Her life ambition is to achieve her set goals, and become a positive role model to those in her life. Shayna Ariola is from Dangriga, and her hobbies are singing and dancing. Her favorite soca song is “Rolly Polly” by her favorite soca artist, Mr Killa. Her ambition is to work hard to further her education so she can achieve her goals and elevate her life. This year’s committee members are Daineli Aranda, Eden Velasquez, Deli Eiley, and Eduardo Aguilar. In addition, all of the costumes used in the pageant and the parade are hand-made by Foreva Fancy proprietor, Aguilar. Gates will be open at 8pm and the show will start at 9pm. Tickets for the show can be purchased at Foreva Fancy Boutique, and are priced at $5 for children, $10 adults and $25 reserved.